A serpent-headed Gorgon who turned anything she looked at into stone is the star attraction in another release in Playtech’s Age of the Gods series. 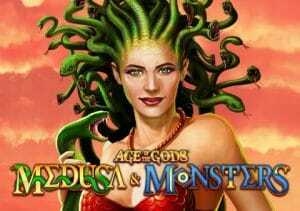 Age of the Gods Medusa and Monsters is an unusual 6 reel, 164 ways to win video slot. Highlights of this latest instalment include stacked symbols on all reels, expanding wilds and a free spins round with shifting Medusa wilds. Stakes range from between 50p and £2,000 per spin. Like the other games in this series, the visuals in Age of the Gods Medusa and Monsters are nicely done. With a cloud-filled, red sky in the background, the plain blue reels include gemstones, ships, swords and 3 mythical monsters. In order of value, you’ll see the three-headed dog Cerberus, a buff-looking Minotaur and a scantily clad Aphrodite. Land 6 of the latter on a payline and you’ll pocket 3 times your bet. All of these 3 creature symbols spin in full stacks and can fill a reel or multiple reels. The Gorgon, who’s as buxom as Aphrodite, is the game’s wild. Whenever she lands, she will expand to turn the whole of the reel wild. Playtech has kept things simple on the features front as the only extra is a free spins round. Medusa’s Gaze Free Games feature – land the 2-high scatter on reels 2, 4 and 6 on the same spin to trigger this round. Your reward will be 6 free spins. Pick 1 of the shield scatters as this will reveal a high paying symbol. Medusa will petrify this symbol. A stacked Medusa starts on reel 6 then moves 1 reel to the left with each free spin, unlocking petrified symbols as she lands on them. Age of the Gods Medusa and Monsters also offers the chance to win 1 of 4 potential progressive jackpot prizes. The jackpot round can activate at random on any spin. Choose from the selection of 20 coins – find 3 that match and that’s the jackpot you’ll win. The big money comes from the Ultimate Jackpot where life-changing wins can be awarded. The Age of the Gods series has proved to be an incredibly popular one and Age of the Gods Medusa and Monsters is another impressive addition. The graphics are nicely crafted and there’s plenty of action thanks to the 164 payline game engine stacked symbols, expanding wilds and bonus feature. If you’ve enjoyed the other video slots in this franchise, then you won’t be disappointed with what you’ll find here. I also recommend you try Medusa and Medusa II from NextGen Gaming as they featured the serpent-headed Gorgon.